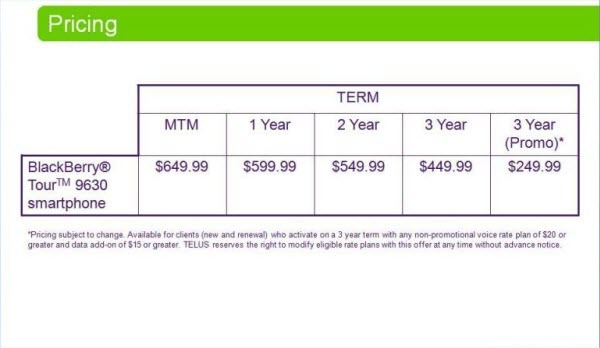 Telus Tour Pricing And Launch Date! It was only a matter of time before this information got out as the pricing and launch date have been floating around for a while now, but this documentation puts a more official stamp of approval on it. 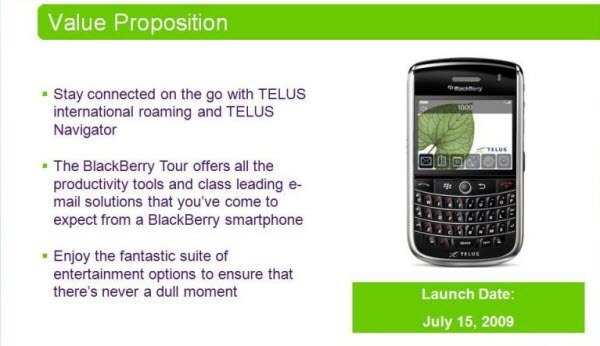 As you can see from the image above, the launch date for the BlackBerry Tour on Telus is going to be July 15th and after the jump you can see an image of the price points Canadian users will be required to pay to get in on all the Tour love. No contract $649.99; 1 year $599.99; 2 year $549.99; 3 year $449.99 and finally the 3 year promo price will be $249.99. Now I would hate to be buying the Tour with no contract but that $249.99 promo price is looking mighty fine.